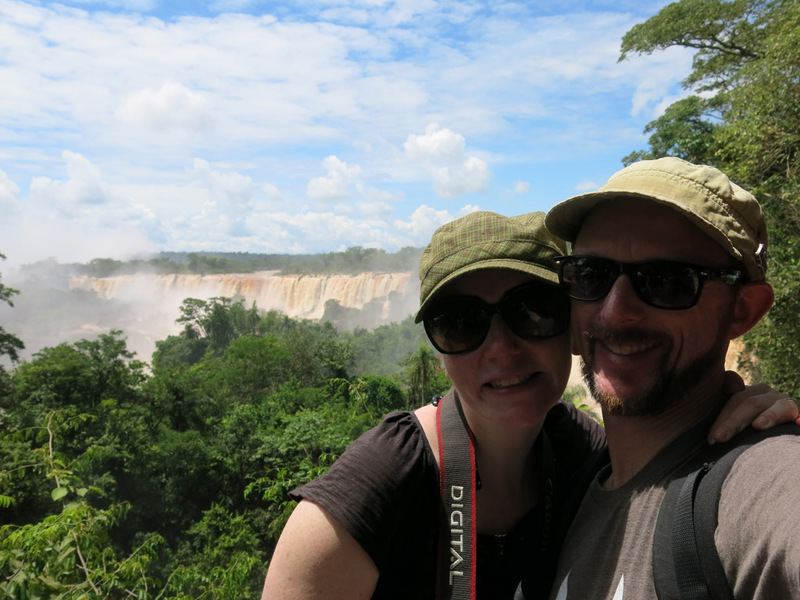 Today was our second and last full day at Iguazu, and sadly the last day of “fun” on our trip. After this it is pretty much all plane travel, airports, and the odd airport hotel. 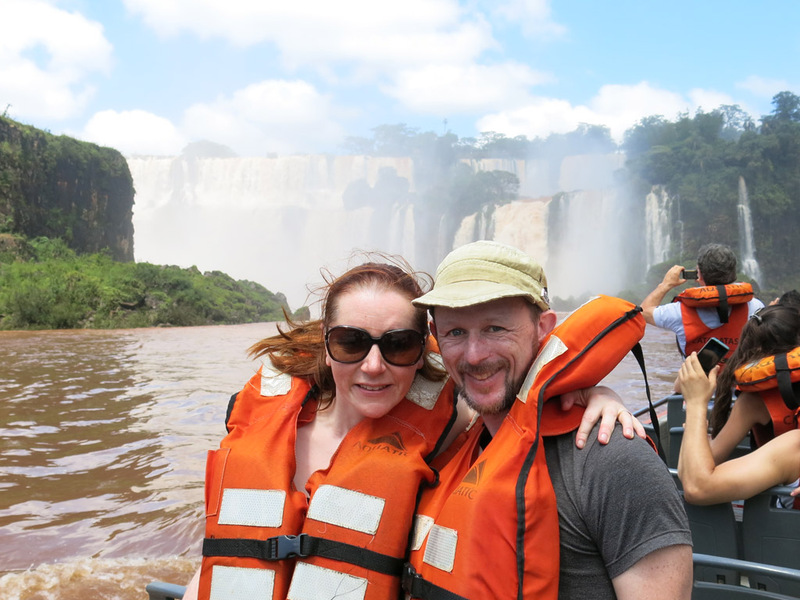 So we needed to fill in the rest of what Iguazu had to offer. 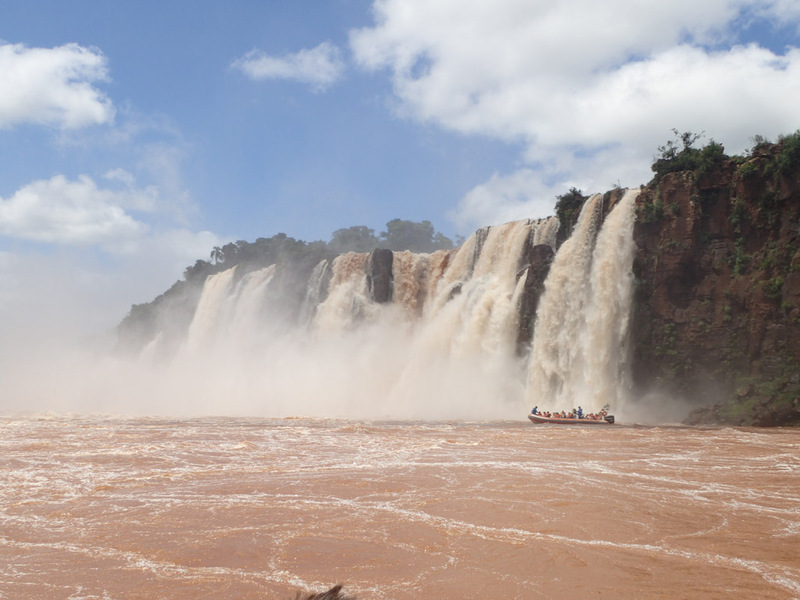 We had one of the Iguazu “must dos” booked for today. One in which we were destined to come back drenched. 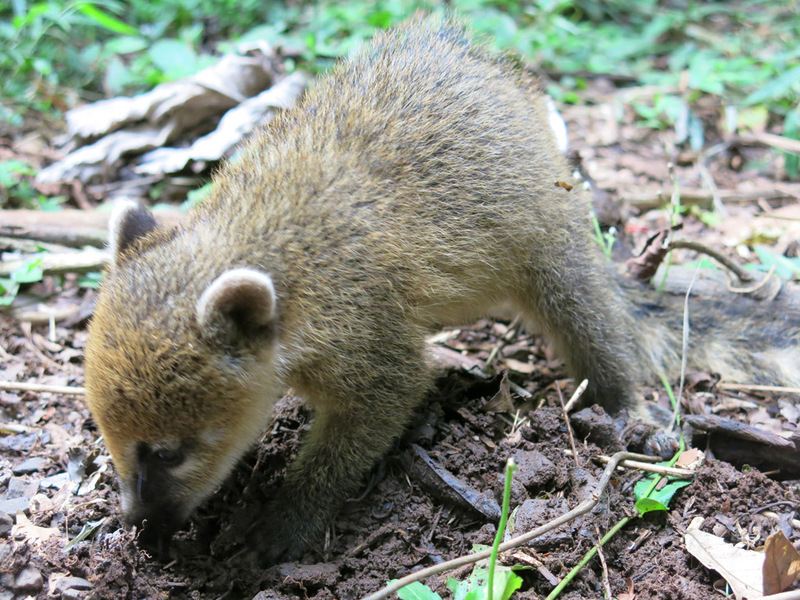 It all started at about 10am, where we met our guides for a half hour drive through the nearby jungle. Sadly we didn’t really get to see much of anything. It was good to see the surrounding jungle, but alas no animals or birds were out, so the local Tucans were going to avoid us this trip it seemed. 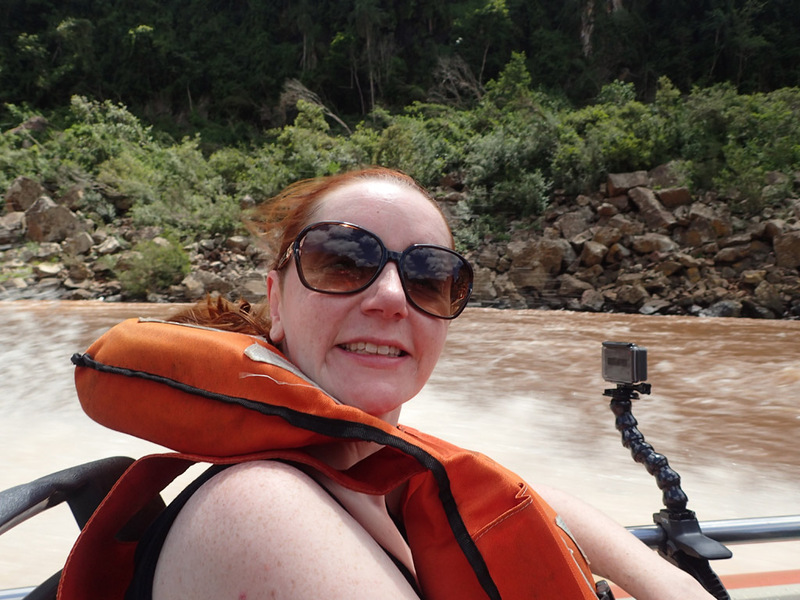 We then arrived at waters edge, where we all got into a speed boat for a cruise up the Igauzu river. Well, cruise is not quite it, rather a cruise with moments of burning through rapids and getting a bit wet. But this was really just a taster for the main course. 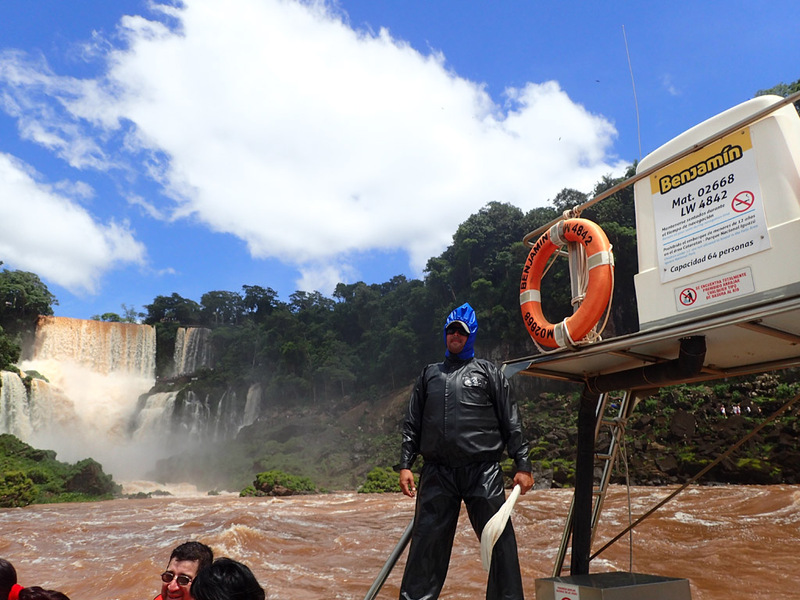 After about 20 minutes we arrived at the foot of a number of the huge waterfalls that make up Iguazu. Down below the noise was deafening, and the sight was incredible… looking upward at the waterfalls that we peered down just the day before. Our driver directed us at one of the key waterfalls and in no time at all we were pretty wet. We had gone right to the edge of one of the main waterfalls and felt the brunt of it. But our driver was not happy with that. Rather we did a quick lap and went back for seconds. This time we seemed to venture in a bit more and then we were SOAKED. Getting wet was an understatement… we were both drenched. Awesome! This wasn’t the end of it though. We went back around to some waterfalls we had seen earlier and got given a closer look at those. And by closer look, I mean getting even wetter, if that was possible. We did a couple of goes into there, and before we knew it we were all done. The boat was full of water and everyone was a mess. But we all loved it. We clambered out and started making our way up the path. This was a great spot, as unlike the day before, the trail had us at the foot of the waterfalls, so it made for quite different vantage points and pics. We slowly made our way up, leaving soggy footprints all the way. Along the way we bumped into some more butterflys. There was the most amazing assortment all about the park. It was about 1pm when we were done, and we decided to take advantage of the fact we had a hotel at our disposal. Getting dry was a priority. Given we had been on all the trails in the park, and our time away was winding up, we decided to take it easy during the afternoon, soaking up the humidity and heat next to the hotel pool. Ahhh… that felt good. 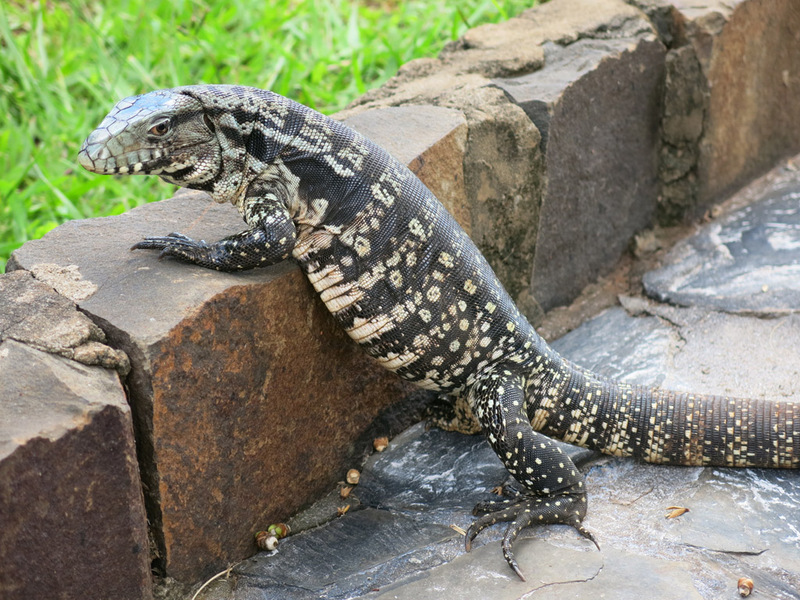 The hotel iguana was just kicking back too. Later in the afternoon, I decided to go for one last quick wander, up to the main entrance of the park. We had bypassed this when we came in, so I went to check out the gift shop and it was pretty mediocre. Not that I was after anything really, but unless I wanted a t-shirt or dodgy handicraft, it was not worth the walk. Kate and I enjoyed a last dinner staring out at the falls from the hotel bar balcony. All good things come to an end. 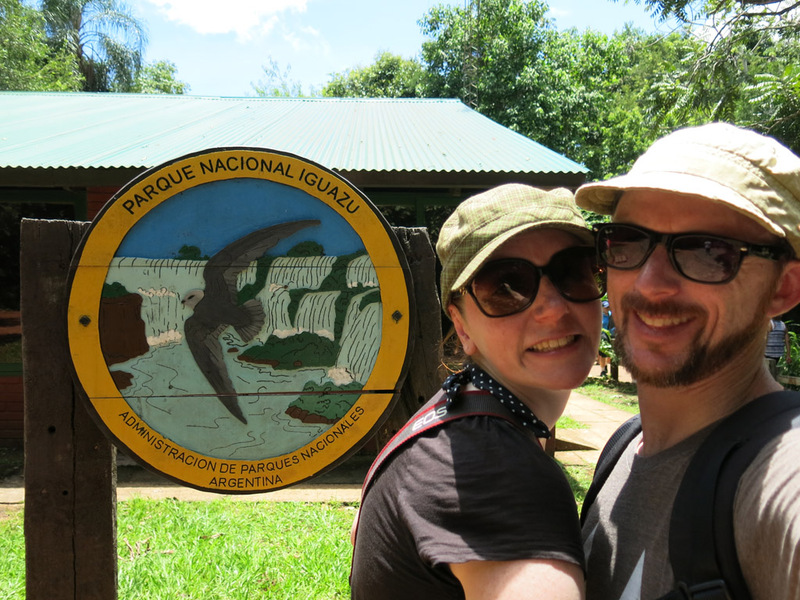 Today was our first full day at Iguazu. You could not have more of a contrast from our previous journeys this trip. As we walked out of our hotel, straight into the national park, it was about 30 degrees and what felt like 1000% humidity. Suddenly I missed the cold. Within the national park, around the falls, there are a number of walks you can do to explore them. 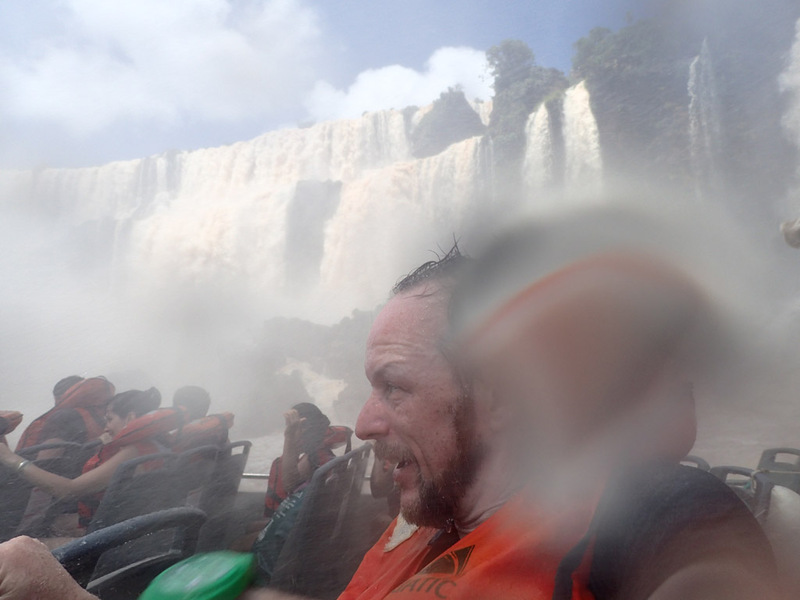 As I mentioned, Iguazu is on the border of a few countries, and each apparently offers their own unique perspectives. 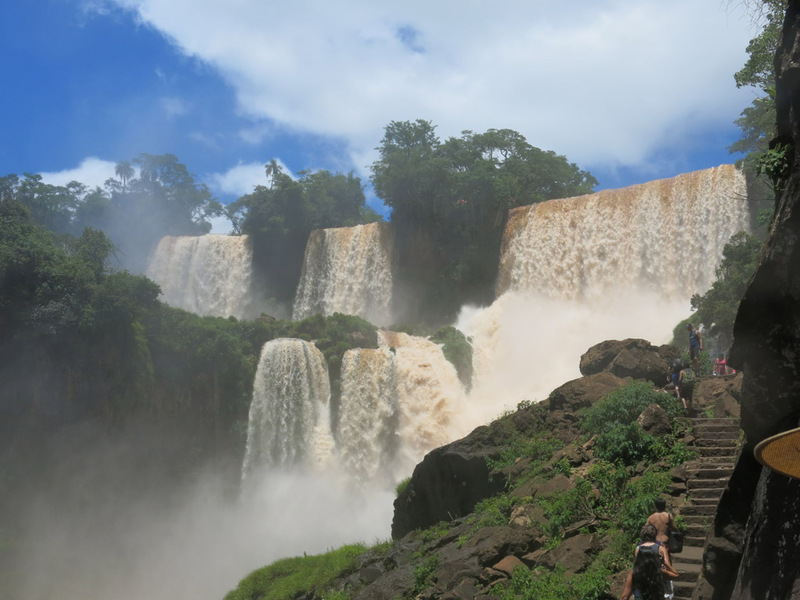 From Brazil (which sadly we would not have time to get to), you see the entire waterfalls, however from in Argentina, you get to be in amongst them all. 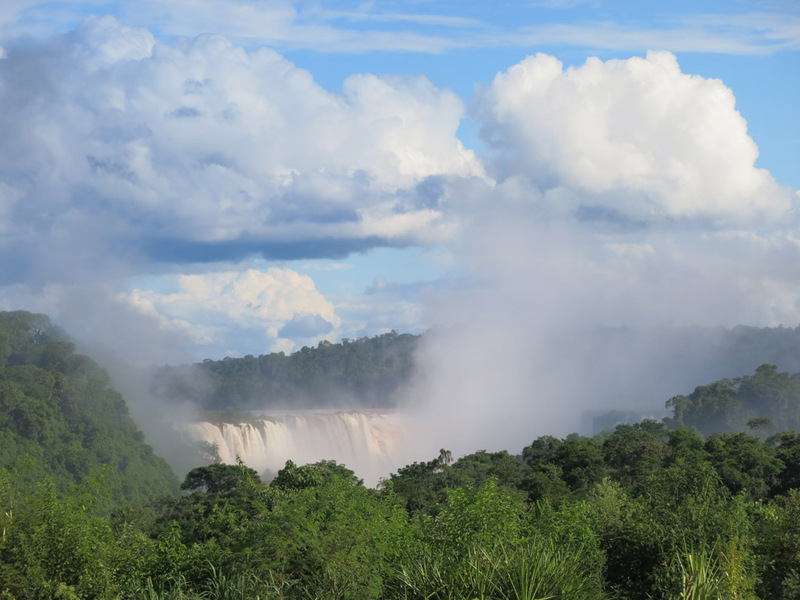 While the idea of seeing them from Brazil was appealing, given the amount of mist and spray, we were not sure what you would really see, so were happy to be here in Argentina. 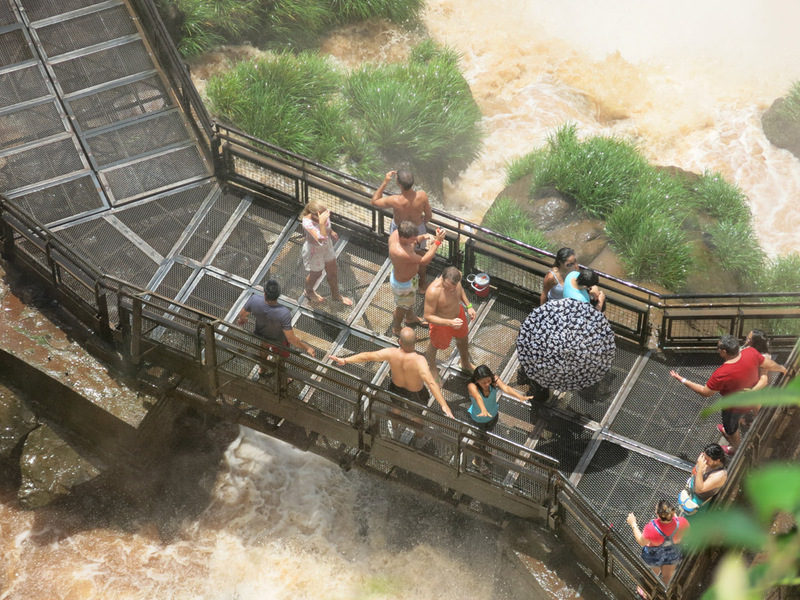 We started with the Paseo Superior walk, which took us along the top of a number of the falls. It was a bit crowded along the walkways between falls, but there was always time to try and get photos as we moved along. But you know, photos never do justice to raging torrents of water do they? Every now and then we would catch the spray from the nearby falls, which was glorious on a hot and steamy day like this one. 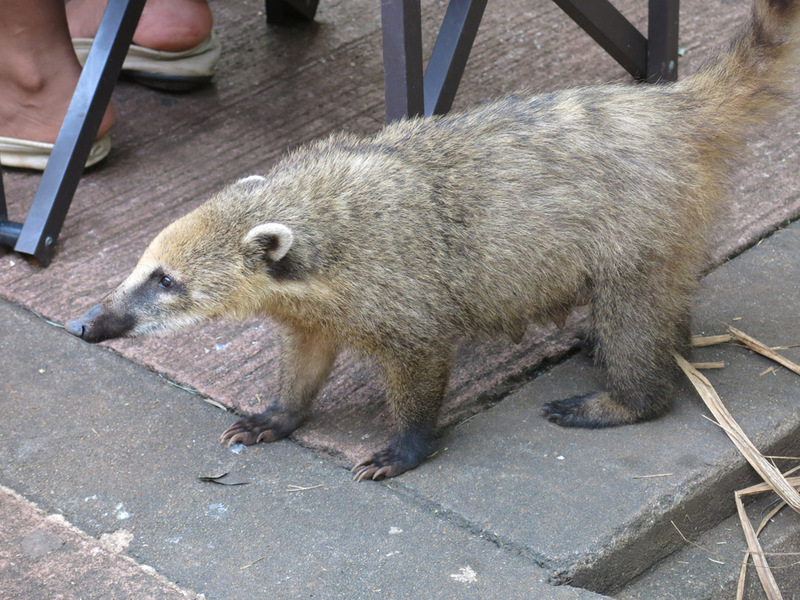 While we were out and about we came across more of the furry little critters. This one did the craziest thing. Someone had set an empty coke bottle on the seat next to them. 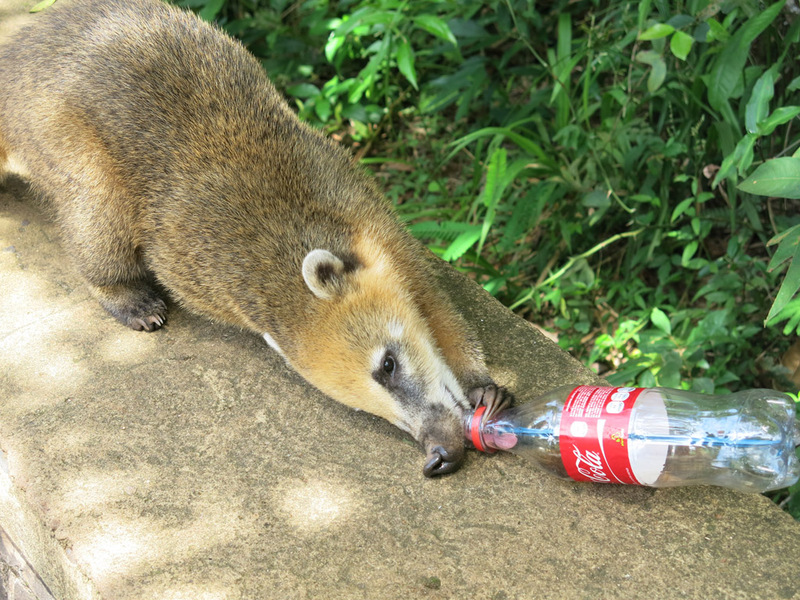 The little guy jumped up, unscrewed the lid using his mouth and claws, and started licking it clean. They certainly have learned a few tricks! It took a couple of hours to wander that path and we were super sweaty by the time we got back to the central area. The limon icy pole tasted so good! 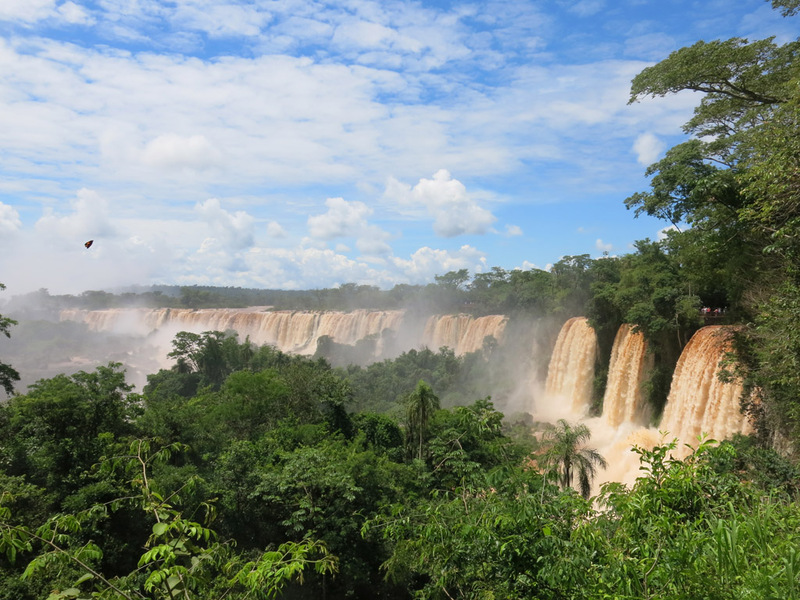 Next plan was to head to the top most falls, Garganta del Diablo, or Devil’s Throat. Now usually you can take the train up or enjoy an half hour walk. We were keen for the walk but for some reason it appeared the path was closed. Ordinarily you would think no probs, but this meant that EVERYBODY was waiting for the train. Oh boy. It took over an hour of waiting in the heat to get on a train. It seems the line/queue system kinda breaks down here in Argentina and things become a bit more free-for-all. Hhhmmm. 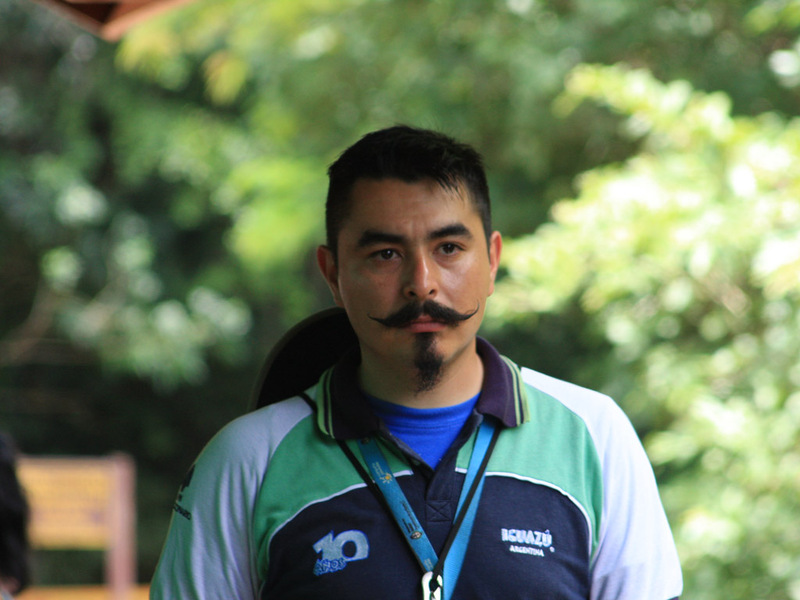 Although, we did see the coolest facial hair so far. This guy was rocking it in a pretty unironic way… much different to back home. But we got on and made our way to the top and made our way across a kilometre of walkway over the fast flowing river. We eventually got to the Devil’s Throat and om my! It was a fury of water and noise and spray. There were numerous falls all descending down. It was pretty awe inspiring. Sadly any kind of line system was also breaking down here and it was every man for themselves in trying to get a good vantage spot. Seemed all the park guides could do was blow their whistle without effect, trying to get people to move along. But it didn’t diminish things too much as the sheer force of nature just swept you up. We were super hot and sweaty by this point and made our way back to catch the train back to the main part of the park. One the way back I met this lovely butterfly who wanted to hang out and be photographed. Check out the freaky green “fangs”. It was getting close to 5pm, so things would be winding up in the park and would be shutting up soon. Seemed like a good time to have a swim. Ah, now that is an advantage of staying the park. Now cooled down we had an early dinner, kicking back and watching the falls as we had a beer and contemplated how awesome things were for us.